"Spicy sauteed shrimp are served in soft tacos with chopped mango, red onion, and a drizzle of kicked-up Ranch dressing." In a small mixing bowl, combine the ranch dressing and Sriracha. Reserve refrigerated. In a separate mixing bowl, combine shrimp, salt, black pepper, red pepper flakes, and lime juice. Toss to combine. Heat a saute pan over medium high heat until hot. Add olive oil, then the shrimp, and saute until pink and cooked through (about 2 to 3 minutes), turning often to cook evenly. 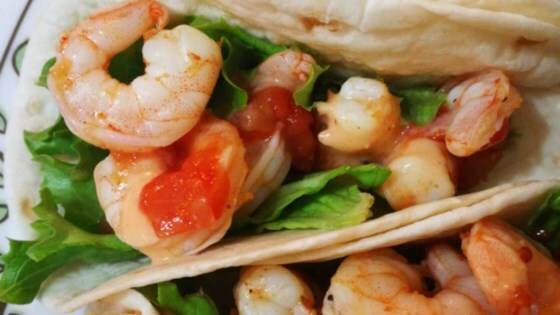 To assemble tacos, place about 4 warm shrimp into each tortilla and top with 1 tbsp. diced mango and 1 tbsp. diced onions. Drizzle with Sriracha ranch dressing and sprinkle with chopped cilantro. Serve with lime wedges to be squeezed over top. Hint: The spiciness of this dish can be adjusted by adding more or less Sriracha to the ranch dressing. Tried out this recipe for dinner tonight. I didn't have limes so I used lemons. I also didn't have red pepper flakes. My husband and I thought it was delicious! Will definitely make this again. Really tasty. Loved the sauce although I was hesitant at first, that part really made the tacos yummy. Delicious, I paired with a mango salsa! !